on sunday we had the missionaries over for dinner. i'd signed up on their calendar back in september with my fingers, toes, and eyes crossed that we'd be in our new place by october 30th (at that point we were still on track to get in by october 1st, haaaaaa). as a general rule i don't invite people over for dinner if i'm not at least going to pretend to cook part of the dinner myself, and also as a general rule i don't normally invite the missionaries over for dinner, and so it was a bit of a gamble. would we have a kitchen by then? if so, would i remember how to heat a pan on the stove without burning things down? if not, would they turn us in if we tried to take them out for pizza on a sunday? by the time the 30th rolled around we'd been in our new place a total of 36 hours. just under the wire! boxes were completely unpacked by then because it turns out fifteen boxes of stuff isn't all that hard to find homes for. and so. the night before, i surveyed my palace. i took stock of our pantry. i remembered i had a knife somewhere. where was it? um, can opener? right. 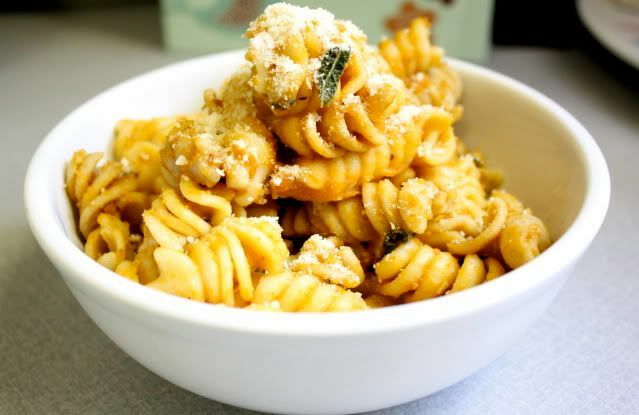 the dish i chose to be my kitchen's maiden voyage was pumpkin sage pasta, one of our favorites. it's really good with sliced chicken sausage on top, if you're into it. 1. Sautee garlic and sage in olive oil and butter in a pan over medium-high heat. 2. Add pumpkin and pasta water. 3. Whisk together until combined. Add more pasta water if sauce is too thick, more pumpkin if too thin. 4. Season with salt, pepper, and red pepper flakes to taste. 5. Pour sauce over drained pasta and stir to combine. 6. Sprinkle with parmesan cheese and serve with a hefty garden salad. ooh, that looks yum! Also GOOD ON YOU! 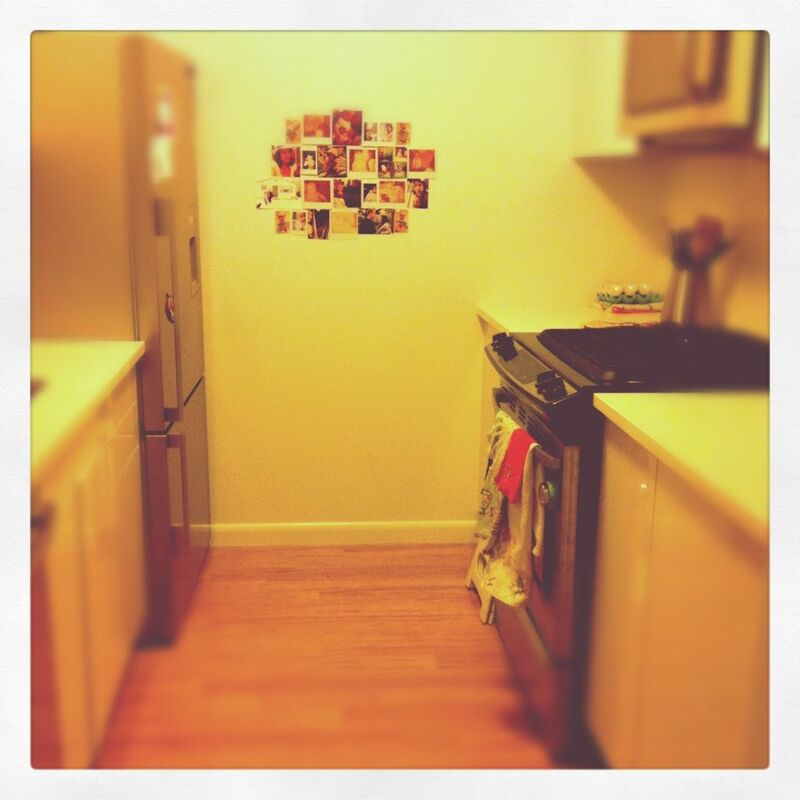 I started a photo wall today too! My roommates were kind of skeptical about me using hot pink duct tape but it turned out WONDERFULLY. So glad y'all are settled in! that looks delicious. i think i shall try it! I feel your pain, Nat! My family always makes jokes about how I can't cook. In reality, I'm not so bad. Maybe I even let them think I can't cook so that I can sleep in longer on Thanksgiving. All I'm saying is your Holbsie should be careful whose cooking he criticizes, you know? P.S. Can't wait to try this pasta! ugh i have to re-do my kitchen soon...and good job on the cooking! i, too, find it difficult to cook more often than not (especially because there's always this cute baby on the floor that needs playing with)! so he started having the missionaries over for breakfast once every second week to also have a meeting with them from 6:30am- 7:30/8am It was so easy and so fun and always gave our house an awesome spirit/feeling start to the day. so I still prefer to have them over for breakfast - we usually do fruit salad and yoghurt, a few types of cereal or oats in winter and if I'm feeling adventurous bacon and egg muffins. More importantly, where the heck are you finding cuban bread????!!! Also, Baby's First Year at Babble isn't the same without you and Huck. I will be trying that this weekend!! Pumpkin Sage...how inspiring... I would have played it safe and done lasagna or something.Way to serve out of the box, yum! well this looks delicious. so glad nat nests is back! Dear Nat, I like your blog...that is all. This sounds SO GOOD. Never would have thought of pumpkin and sage. I'm going to try it soon, maybe my pumpkin-hating husband will try it. If not, more for me! Also: YAY YAY YAY for a kitchen big enough for cooking! oh my goodness how am i just now seeing this? my cousin tried your recipe & loved it, so i made it tonight for a big dinner party. all nine guests raved! i used spaghetti squash instead of pasta. (have you tried spaghetti squash? it's incredible.) thanks a mill for sharing! Yum! I tried this recipe, too! Thanks for sharing! HOW LOVELY ARE THY BRANCHES ANYWAY? C-SECTION VIA VAMPIRE TEETH ANYONE?